Mosquitoes carry several diseases that pose an emerging threat to society. Outbreaks of these diseases are often sudden and can spread to previously unaffected areas. For example, the Zika virus was discovered in 1947, but only received international attention when it spread to the Americas in 2014, where it caused over 100,000 cases in Brazil alone. While we now recognize the threat Zika can pose for public health, our knowledge about the ecology of the disease remains poor. Nine species of mosquitoes are known to be able to carry the Zika virus, but it cannot be ruled out that other mosquitoes may also be able to spread the disease. There are hundreds of species of mosquitoes, and testing all of them is difficult and costly. So far, only a small number of species have been tested to see if they transmit Zika. However, computational tools called decision trees could help by predicting which mosquitoes can transmit a virus based on common traits, such as a mosquito's geographic range, or the symptoms of a virus. Evans et al. used decision trees to create a model that predicts which species of mosquitoes are potential carriers of Zika virus and should therefore be prioritized for testing. The model took into account all known viruses that belong to the same family as Zika virus and the mosquitoes that carry them. Evans et al. predict that 35 species may be able to carry the Zika virus, seven of which are found in the United States. Two of these mosquito species are known to transmit West Nile Virus and are therefore prime examples of species that should be prioritized for testing. 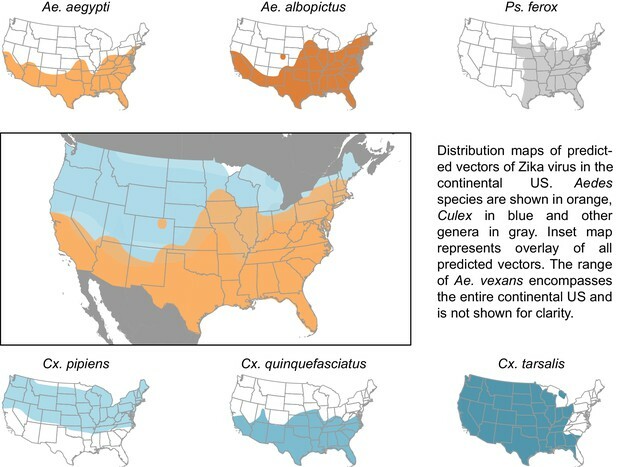 Together, the ranges of the seven American species encompass the whole United States, suggesting Zika virus could affect a much larger area than previously anticipated. The next step following on from this work will be to carry out experiments to test if the 35 mosquitoes identified by the model are actually able to transmit the Zika virus. In 2014, Zika virus was introduced into Brazil and Haiti, from where it rapidly spread throughout the Americas. By January 2017, over 100,000 cases had been confirmed in 24 different states in Brazil (http://ais.paho.org/phip/viz/ed_zika_cases.asp), with large numbers of reports from many other counties in South and Central America (Faria et al., 2016). Originally isolated in Uganda in 1947, the virus remained poorly understood until it began to spread within the South Pacific, including an outbreak affecting 75% of the residents on the island of Yap in 2007 (49 confirmed cases) and over 32,000 cases in the rest of Oceania in 2013–2014, the largest outbreak prior to the Americas (2016-present) (Cao-Lormeau et al., 2016; Duffy et al., 2009). Guillian-Barré syndrome, a neurological pathology associated with Zika virus infection, was first recognized at this time (Cao-Lormeau et al., 2016). Similarly, an increase in newborn microcephaly was found to be correlated with the increase in Zika cases in Brazil in 2015 and 2016 (Schuler-Faccini et al., 2016). For this reason, in February 2016, the World Health Organization declared the American Zika virus epidemic to be a Public Health Emergency of International Concern. Despite its public health importance, the ecology of Zika virus transmission has been poorly understood until recently. It has been presumed that Aedes aegypti and Ae. albopictus are the primary vectors due to epidemiologic association with Zika virus (Messina et al., 2016), viral isolation from and transmission experiments with field populations (especially in Ae. aegypti [Haddow et al., 2012; Boorman and Porterfield, 1956; Haddow et al., 1964]), and association with related arboviruses (e.g. dengue fever virus, yellow fever virus). Predictions of the potential geographic range of Zika virus in the United States,and associated estimates for the size of the vulnerable population, are therefore primarily based on the distributions of Ae. aegypti and Ae. albopictus, which jointly extend across the Southwest, Gulf coast, and mid-Atlantic regions of the United States (Centers for Disease Control and Prevention, 2016). We reasoned, however, that if other, presently unidentified Zika-competent mosquitoes exist in the Americas, then these projections may be too restricted and therefore optimistically biased. Additionally, recent experimental studies show that the ability of Ae. aegypti and Ae. albopictus to transmit the virus varies significantly across mosquito populations and geographic regions (Chouin-Carneiro et al., 2016), with some populations exhibiting low dissemination rates even though the initial viral titer after inoculation may be high (Diagne et al., 2015). This suggests that in some locations other species may be involved in transmission. The outbreak on Yap, for example, was driven by a different species, Ae. hensilli (Ledermann et al., 2014). Closely related viruses of the Flaviviridae family are vectored by over nine mosquito species, on average (see Supplementary Data). Thus, because Zika virus may be associated with multiple mosquito species, we considered it necessary to develop a more comprehensive list of potential Zika vectors. The gold standard for identifying competent disease vectors requires isolating virus from field-collected mosquitoes, followed by experimental inoculation and laboratory investigation of viral dissemination throughout the body and to the salivary glands (Barnett, 1960; Hardy et al., 1983), and, when possible, successful transmission back to the vertebrate host (e.g. Komar et al., 2003). Unfortunately, these methods are costly, often underestimate the risk of transmission (Bustamante and Lord, 2010), and the amount of time required for analyses can delay decision making during an outbreak (Day, 2001). To address the problem of identifying potential vector candidates in an actionable time frame, we therefore pursued a data-driven approach to identifying candidate vectors aided by machine learning algorithms for identifying patterns in high dimensional data. If the propensity of mosquito species to associate with Zika virus is statistically associated with common mosquito traits, it is possible to rank mosquito species by the degree of risk represented by their traits – a comparative approach similar to the analysis of risk factors in epidemiology. For instance, a model could be constructed to estimate the statistical discrepancy between the traits of known vectors (i.e., Ae. aegypti, Ae. albopictus, and Ae. hensilli) and the traits of all possible vectors. Unfortunately, this simplistic approach would inevitably fail due to the small amount of available data (i.e., sample size of 3). Thus, we developed an indirect approach that leverages the information contained in the associations among many virus-mosquito pairs to inform us about specific associations. Specifically, our method identifies covariates associated with the propensity for mosquito species to vector any flavivirus. 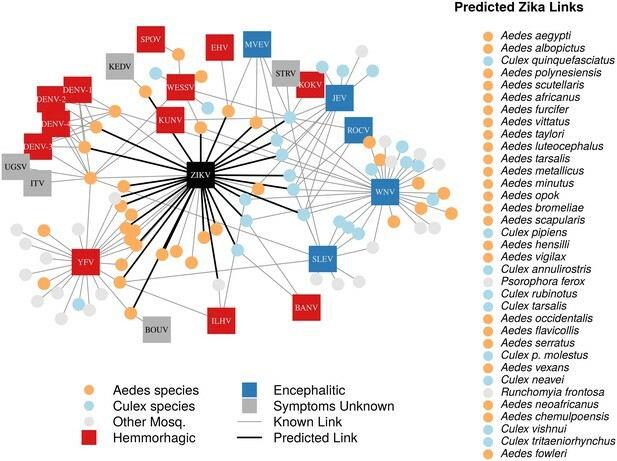 From this, we constructed a model of the mosquito-flavivirus network and then extracted from this model the life history profile and species list of mosquitoes predicted to associate with Zika virus, which we recommend be experimentally tested for Zika virus competence. In total, we identified 132 vector-virus pairs, consisting of 77 mosquito species and 37 flaviviruses. The majority of these species were Aedes (32) or Culex (24) species. Our supplementary dataset consisted of an additional 103 mosquito species suspected to transmit flaviviruses, but for which evidence of a full transmission cycle does not exist. This resulted in 180 potential mosquito-Zika pairs on which to predict with our trained model. As expected, closely related viruses, such as the four strains of dengue, shared many of the same vectors and were clustered in our network diagram (Figure 1). The distribution of vectors to viruses was uneven, with a few viruses vectored by many mosquito species, and rarer viruses vectored by only one or two species. The virus with the most known competent vectors was West Nile virus (31 mosquito vectors), followed by yellow fever virus (24 mosquito vectors). In general, encephalitic viruses such as West Nile virus were found to be more commonly vectored by Culex mosquitoes and hemorrhagic viruses were found to be more commonly vectored by Aedes mosquitoes (see Gould and Solomon (2008) for further distinctions within Flaviviridae) (Figure 1). A network diagram of mosquito vectors (circles) and their flavivirus pairs (rectangles). The Culex mosquitoes (light blue) and primarily encephalitic viruses (blue) are more clustered than the Aedes (orange) and hemmorhagic viruses (red). Notably, West Nile Virus is vectored by both Aedes and Culex species. 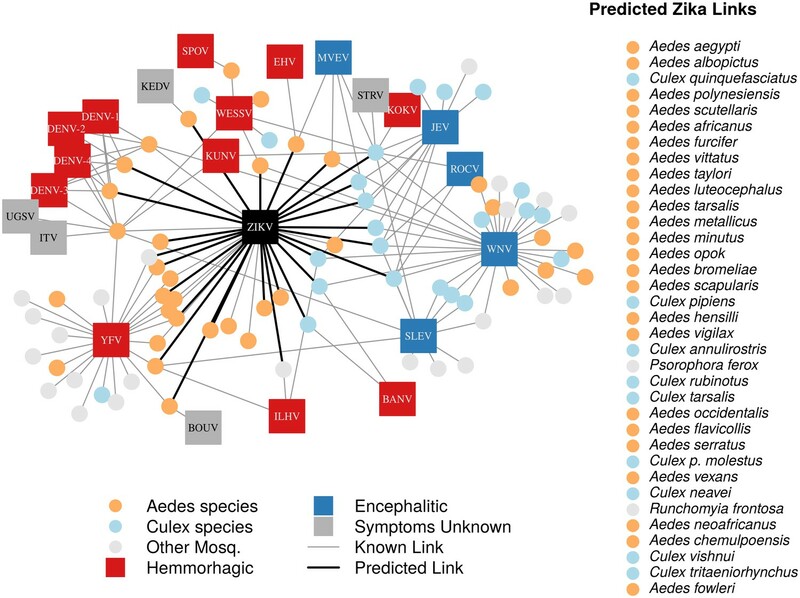 Predicted vectors of Zika are shown by bolded links in black. The inset shows predicted vectors of Zika and species names, ordered by the model’s propensity scores. Included flaviviruses are Banzi virus (BANV), Bouboui virus (BOUV), dengue virus strains 1, 2, 3 and 4 (DENV-1,2,3,4), Edge Hill virus (EHV), Ilheus virus (ILHV), Israel turkey meningoencephalomyelitis virus (ITV), Japanese encephalitis virus (JEV), Kedougou virus (KEDV), Kokobera virus (KOKV), Kunjin virus (KUNV), Murray Valley encephalitis virus (MVEV), Rocio virus (ROCV), St. Louis encephalitis virus (SLEV), Spondwendi virus (SPOV), Stratford virus (STRV), Uganda S virus (UGSV), Wesselsbron virus (WESSV), West Nile Virus (WNV), yellow fever virus (YFV), and Zika virus (ZIKV). Our ensemble of BRT models trained on common vector and virus traits predicted mosquito vector-virus pairs in the test dataset with high accuracy (AUC = 0.92 ± 0.02; sensitivity = 0.858 ± 0.04; specificity = 0.872 ± 0.04). Due to non-monotonicity and existence of interactions among predictor variables within our model, one cannot make general statements about the directionality of effect. Thus, we focus on the relative importance of different variables to model performance. The most important variable for accurately predicting the presence of vector-virus pair was the subgenus of the mosquito species, followed by continental range (e.g. continents on which species are present). 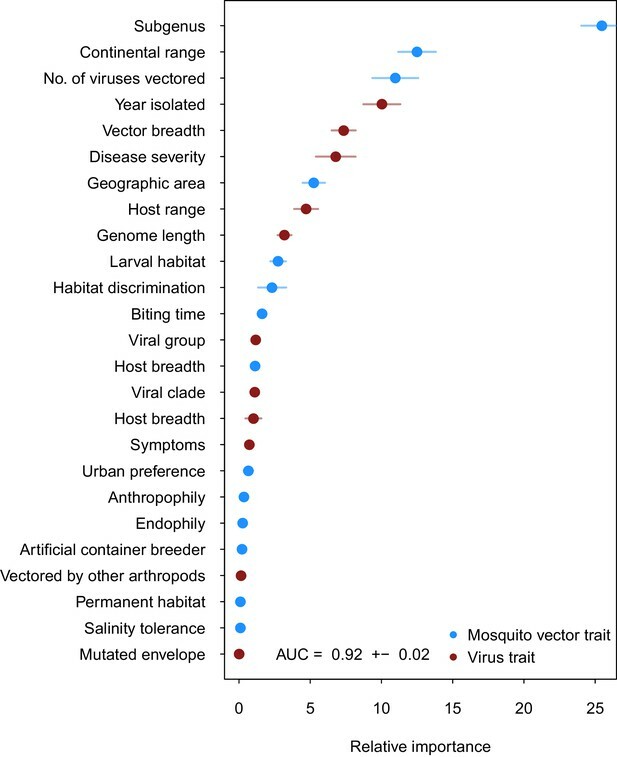 The number of viruses vectored by a mosquito species and number of mosquito vectors of a virus were the third and fifth most important variables, respectively. Unsurprisingly, this suggests that, when controlling for other variables, mosquitoes and viruses with more known vector-virus pairs (i.e., more viruses vectored and more hosts infected, respectively), are more likely to be part of a predicted pair by the model. Mosquito ecological traits such as larval habitat and salinity tolerance were generally less important than a species’ phylogeny or geographic range (Figure 2). Variable importance by permutation, averaged over 25 models. Because some categorical variables were treated as binary by our model (i.e. continental range), the relative importance of each binary variable was summed to result in the overall importance of the categorical variable. Mosquito and virus traits are shown in blue and maroon, respectively. Error bars represent the standard error from 25 models. When applied to the 180 potential mosquito-Zika pairs, the model predicted thirty-five vectors to be ranked above the threshold (set at the value of the lowest-ranked known vector), for a total of nine known vectors and twenty-six novel, predicted mosquito vectors of Zika (Table 1). Of these vectors, there were twenty-four Aedes species, nine Culex species, one Psorophora species, and one Runchomyia species. The GBM model’s top two ranked vectors for Zika are the most highly-suspected vectors of Zika virus, Ae. aegypti and Ae. albopictus. Our supplementary and primary models generally concur and their ranking of potential Zika virus vectors are highly correlated (ρ = 0.508 and ρ = 0.693 on raw and thresholded predictions, respectively). As one might expect, the supplementary model assigned fewer scores of low propensity (Appendix 1—figure 2), suggesting that incorporating this additional uncertainty in the training dataset eroded the model's ability to distinguish negative links. The supplementary model’s performance on the testing data (AUC = 0.84 ± 0.02), however, indicates that the additional uncertainty did not impede model performance. When trained on ‘leave-one-out’ datasets, all three models were able to predict the testing data with high accuracy (AUC = 0.91, AUC = 0.91, AUC = 0.92 for West Nile, dengue, and yellow fever viruses, respectively). Performance varied when models were validated against predictions of ‘known outcomes’. A model trained without West Nile virus predicted highly linked vectors reasonably well (AUC = 0.69), however it assigned low scores to rarer ‘known’ vectors, such as Culiseta inornata, which was only associated with West Nile virus. Similarly, the model trained on the dengue-omitted dataset predicted training data and vectors of dengue itself with high accuracy (AUC = 0.92). While the model trained without yellow fever performed well on the testing data, it performed poorly when predicting vectors of yellow fever virus (AUC = 0.47). Unlike West Nile and dengue viruses, the majority of the known vectors of yellow fever are only associated with yellow fever (i.e. a single vector-virus link), and so were excluded completely from the training data when all yellow fever links were omitted. Additionally, several of the vector species are of the Haemagogus genus, which was completely absent from the training data. Given the importance of phylogeny of the vector species in predicting vector-virus links, it follows that a dataset with a novel subgenus would be difficult for the model to predict on, resulting in low model performance. The low performance of this model illustrates that incorporating common traits and additional vector-virus links improves model prediction. When traits were not available in the training dataset, model performance was much lower, suggesting that there exists a statistical association between a vectors’ traits and its ability to transmit a virus. Zika virus is unprecedented among emerging arboviruses in its combination of severe public health hazard, rapid spread, and poor scientific understanding. Particularly crucial to public health preparedness is knowledge about the geographic extent of potentially at risk populations and local environmental conditions for transmission, which are determined by the presence of competent vectors. Until now, identifying additional competent vector species has been a low priority because Zika virus has historically been geographically restricted to a narrow region of equatorial Africa and Asia (Petersen et al., 2016), and the mild symptoms of infection made its range expansion since the 1950’s relatively unremarkable. However, with its relatively recent and rapid expansion into the Americas and its association with severe neurological disorders, the prediction of potential disease vectors in non-endemic areas has become a matter of critical public health importance. We identify these potential vector species by developing a data-driven model that identifies candidate vector species of Zika virus by leveraging data on traits of mosquito vectors and their flaviviruses. We suggest that empirical work should prioritize these species in their evaluation of vector competence of mosquitoes for Zika virus. Our model predicts that fewer than one third of the potential mosquito vectors of Zika virus have been identified, with over twenty-five additional mosquito species worldwide that may have the capacity to contribute to transmission. The continuing focus in the published literature on two species known to transmit Zika virus (Ae. aegypti and Ae. albopictus) ignores the potential role of other vectors, potentially misrepresenting the spatial extent of risk. In particular, four species predicted by our model to be competent vectors – Ae. vexans, Culex quinquefasciatus, Cx. pipiens, and Cx. tarsalis – are found throughout the continental United States. Further, the three Culex species are primary vectors of West Nile virus (Farajollahi et al., 2011). Cx. quinquefasciatus and Cx. pipiens were ranked 3rd and 17th by our model, respectively, and together these species were the highest-ranking species endemic to the United States after the known vectors (Ae. aegypti and Ae. albopictus). Cx. quinquefasciatus has previously been implicated as an important vector of encephalitic flaviviruses, specifically West Nile virus and St. Louis encephalitis (Turell et al., 2005; Hayes et al., 2005), and a hybridization of the species with Cx. pipiens readily bites humans (Fonseca et al., 2004). The empirical data available on the vector competence of Cx. pipiens and Cx. quinquefasciatus is currently mixed, with some studies finding evidence for virus transmission and others not (Guo et al., 2016; Aliota et al., 2016; Fernandes et al., 2016; Huang et al., 2016). These results suggest, in combination with evidence for significant genotype x genotype effects on the vector competence of Ae. aegypti and Ae. albopictus to transmit Zika (Chouin-Carneiro et al., 2016), that the vector competence of Cx. pipiens and Cx. quinquefasciatus for Zika virus could be highly dependent upon the genetic background of the mosquito-virus pairing, as well as local environmental conditions. Thus, considering their anthropophilic natures and wide geographic ranges, Cx. quinquefasciatus and Cx. pipiens could potentially play a larger role in the transmission of Zika in the continental United States. Further experimental research into the competence of populations of Cx. pipiens to transmit Zika virus across a wider geographic range is therefore highly recommended, and should be prioritized. The vectors predicted by our model have a combined geographic range much larger than that of the currently suspected vectors of Zika (Figure 3), suggesting that, were these species to be confirmed as vectors, a larger population may be at risk of Zika infection than depicted by maps focusing solely on Ae. aegypti and Ae. albopictus. The range of Cx. pipiens includes the Pacific Northwest and the upper mid-West, areas that are not within the known range of Ae. aegypti or Ae. albopictus (Darsie and Ward, 2005). Furthermore, Ae. vexans, another predicted vector of Zika virus, is found throughout the continental US and the range of Cx. tarsalis extends along the entire West coast (Darsie and Ward, 2005). On a finer scale, these species use a more diverse set of habitats, with Ae. aegypti and Cx. quinquefasciatus mainly breeding in artificial containers, and Ae. vexans and Ae. albopictus being relatively indiscriminate in their breeding sites, including breeding in natural sites such as tree holes and swamps. Therefore, in addition to the wider geographic region supporting potential vectors, these findings suggest that both rural and urban areas could serve as habitat for potential vectors of Zika. We recommend experimental tests of these species for competency to transmit Zika virus, because a confirmation of these vectors would necessitate expanding public health efforts to these areas not currently considered at risk. Distribution maps of predicted vectors of Zika virus in the continental US. Maps of Aedes species are based on Centers for disease control and prevention (2016). All other species’ distributions are georectified maps from Darsie and Ward (2005). While transmission requires a competent vector, vector competence does not necessarily equal transmission risk or inform vectorial capacity. There are many biological factors that, in conjunction with positive vector competence, determine a vector’s role in disease transmission. For example, although Ae. aegypti mosquitoes are efficient vectors of West Nile virus, they prefer to feed on humans, which are dead-head hosts for the disease, and therefore have low potential to serve as a vector (Turell et al., 2005). Psorophora ferox, although predicted by our model as a potential vector of Zika virus, would likely play a limited role in transmission because it rarely feeds on humans (Molaei et al., 2008). Additionally, vector competence is dynamic, and may be mediated by environmental factors that influence viral development and mosquito immunity (Muturi and Alto, 2011). Therefore, our list of potential vectors of Zika represents a comprehensive starting point, which should be furthered narrowed by empirical work and consideration of biological details that impact transmission dynamics. Given the severe neurological side-effects of Zika virus infection, beginning with the most conservative method of vector prediction ensures that risk is not underestimated, and allows public health agencies to interpret the possibility of Zika transmission given local conditions. Our model serves as a starting point to streamlining empirical efforts to identify areas and populations at risk for Zika transmission. While our model enables data-driven predictions about the geographic area at potential risk of Zika transmission, subsequent empirical work investigating Zika vector competence and transmission efficiency is required for model validation, and to inform future analyses of transmission dynamics. For example, in spite of its low transmission efficiency in certain geographic regions (Chouin-Carneiro et al., 2016), Ae. aegypti is anthropophilic (Powell and Tabachnick, 2013), and may therefore pose a greater risk of human-to-human Zika virus transmission than mosquitoes that bite a wider variety of animals. On the other hand, mosquito species that prefer certain hosts in rural environments are known to alter their feeding behaviors to bite alternative hosts (e.g., humans and rodents) in urban settings, due to changes in host community composition (Chaves et al., 2010). Environmental factors such as precipitation and temperature directly influence mosquito populations, and determine the density of vectors in a given area (Thomson et al., 2006), an important factor in transmission risk. Additionally, socio-economic factors such as housing type and lifestyle can decrease a populations’ contact with mosquito vectors, and lower the risk of transmission to humans (Moreno-Madriñán and Turell, 2017). Effective risk modeling and forecasting the range expansion of Zika virus in the United States will depend on validating the vector status of these species, as well as resolving behavioral and biological details that impact transmission dynamics. Although we developed this model with Zika virus in mind, our findings have implications for other emerging flaviviruses and contribute to the recently developed methodology applying machine learning methods to the prediction of unknown agents of infectious diseases. This technique has been used to predict rodent reservoirs of disease (Han et al., 2015) and bat carriers of filoviruses (Han et al., 2016) by training models with host-specific data. Our model, however, incorporates additional data by constructing a vector-virus network that is used to inform predictions of vector-virus associations. The combination of common virus traits with vector-specific traits enabled us to predict potential mosquito vectors of specific flaviviruses, and to train the model on additional information distributed throughout the flavivirus-mosquito network. Uncertainty in our model arises through uncertainty inherent in our datasets. Vector status is not static (e.g. mutation in the chikungunya virus to increase transmission by Ae. albopictus [Weaver and Forrester, 2015]) and can vary across vector populations (Bennett et al., 2002). When incorporating uncertainty in vector status through our supplementary model, our predictions generally agreed with that of our original model. However, the increased uncertainty did reduce the models’ ability to distinguish negative links, resulting in higher uncertainty in propensity scores (as measured by standard deviation) and a larger number of predicted vectors. Additionally, the model performs poorly when predicting on vector-virus links with trait levels not included in the training data set, as was the case when omitting yellow fever virus. Another source of uncertainty is regarding vector and virus traits. In addition to intraspecific variation in biological traits, many vectors are understudied, and common traits such as biting activity are unknown to the level of species. Additional study into the behavior and biology of less common vector species would increase the accuracy of prediction techniques such as this, and allow for a better of understanding of species’ potential role as vectors. Interestingly, our constructed flavivirus-mosquito network generally concurs with the proposed dichotomy of Aedes species vectoring hemorrhagic or febrile arboviruses and Culex species vectoring neurological or encephalitic viruses (Grard et al., 2010) (Figure 1). However, there are several exceptions to this trend, notably West Nile virus, which is vectored by several Aedes species. Additionally, our model predicts several Culex species to be possible vectors of Zika virus. While this may initially seem contrary to the common phylogenetic pairing of vectors and viruses noted above, Zika’s symptoms, like West Nile virus, are both febrile and neurological. Thus, its symptoms do not follow the conventional hemorrhagic/encephalitic division. The ability of Zika virus to be vectored by a diversity of mosquito vectors could have important public health consequences, as it may expand both the geographic range and seasonal transmission risk of Zika virus, and warrants further empirical investigation. Considering our predictions of potential vector species and their combined ranges, species on the candidate vector list need to be validated to inform the response to Zika virus. Vector control efforts that target Aedes species exclusively may ultimately be unsuccessful in controlling transmission of Zika because they do not control other, unknown vectors. For example, the release of genetically modified Ae. aegypti to control vector density through sterile insect technique is species-specific and would not control alternative vectors (Alphey et al., 2010). Additionally, species’ habitat preferences differ, and control efforts based singularly on reducing Aedes larval habitat will not be as successful at controlling Cx. quinquefasciatus populations (Rey et al., 2006). Predicted vectors of Zika virus must be empirically tested and, if confirmed, vector control efforts would need to respond by widening their focus to control the abundance of all predicted vectors of Zika virus. Similarly, if control efforts are to include all areas at potential risk of disease transmission, public health efforts would need to expand to address regions such as the northern Midwest that fall within the range of the additional vector species predicted by our model. An understanding of the capacity of mosquito species to vector Zika virus is necessary to prepare for the potential establishment of Zika virus in the United States, and we recommend that experimental work start with this list of candidate vector species. Our dataset comprised a matrix of vector-virus pairs relating all known flaviviruses and their mosquito vectors. To construct this matrix, we first compiled a list of mosquito-borne flaviviruses to include in our study (Van Regenmortel et al., 2000; Kuno et al., 1998; Cook and Holmes, 2006). Viruses that only infect mosquitoes and are not known to infect humans were not included. Using this list, we constructed a mosquito-virus pair matrix based on the Global Infectious Diseases and Epidemiology Network database (GIDEON, 2016), the International Catalog of Arboviruses Including Certain Other Viruses of Vertebrates (ArboCat) (Karabatsos, 1985), The Encyclopedia of Medical and Veterinary Entomology (Russell et al., 2013)and Mackenzie et al. (2012). We defined a known vector-virus pair as one for which the full transmission cycle (i.e, infection of mosquito via an infected host (mammal or avian) or bloodmeal that is able to be transmitted via saliva) has been observed. Basing vector competence on isolation or intrathoracic injection bypasses several important barriers to transmission (Hardy et al., 1983), and may not be true evidence of a mosquito’s ability to transmit an arbovirus. We found our definition to be more conservative than that which is commonly used in disease databases (e.g. Global Infectious Diseases and Epidemiology Network database), which often assumes isolation from wild-caught mosquitoes to be evidence of a mosquito’s role as a vector. Therefore, a supplementary analysis investigates the robustness of our findings with regards to uncertainty in vector status by comparing the analysis reported in the main text to a second analysis in which any kind of evidence for association, including merely isolating the virus in wild-caught mosquitoes, is taken as a basis for connection in the virus-vector network (see Appendix 1 for analysis and results). Fifteen mosquito traits (Appendix 2—table 1) and twelve virus traits (Appendix 2—table 2) were collected from the literature. For the mosquito species, the geographic range was defined as the number of countries in which the species has been collected, based on Walter Reed Biosystematics Unit, (2016). While there are uncertainties in species’ ranges due to false absences, this represents the most comprehensive, standardized dataset available that includes both rare and common mosquito species. A species’ continental extent was recorded as a binary value of its presence by continent. A species’ host range was defined as the number of taxonomic classes the species is known to feed on, with the Mammalia class further split into non-human primates and other mammals, because of the important role primates play in zoonotic spillovers of vector-borne disease (e.g. dengue, chikungunya, yellow fever, and Zika viruses) (Weaver, 2005; Diallo et al., 2005; Weaver et al., 2016). The total number of unique flaviviruses observed per mosquito species was calculated from our mosquito-flavivirus matrix. All other traits were based on consensus in the literature (see Appendix III for sources by species). For three traits – urban preference, endophily (a proclivity to bite indoors), and salinity tolerance – if evidence of that trait for a mosquito was not found in the literature, it was assumed to be negative. Predicted vectors of Zika virus, as reported by our model. Mosquito species endemic to the continental United States are bolded. A species is defined as a known vector of Zika virus if a full transmission cycle (see main text) has been observed. We collected data on the following virus traits: host range (Mahy, 2009; Mackenzie et al., 2012; Chambers and Monath, 2003; Cook and Zumla, 2009b), disease severity (Mackenzie et al., 2012), human illness (Chambers and Monath, 2003; Cook and Zumla, 2009), the presence of a mutated envelope protein, which controls viral entry into cells (Grard et al., 2010), year of isolation (Karabatsos, 1985), and host range (Karabatsos, 1985). Disease severity was based on Mackenzie et al. (2012), ranging from no known symptoms (e.g. Kunjin virus) to severe symptoms and significant human mortality (e.g. yellow fever virus). For each virus, vector range was calculated as the number of mosquito species for which the full transmission cycle has been observed. Genome length was calculated as the mean of all complete genome sequences listed for each flavivirus in the Virus Pathogen Database and Analysis Resource (http://www.viprbrc.org/). For more recently discovered flaviviruses not yet cataloged in the above databases (i.e., New Mapoon Virus, Iquape virus), viral traits were gathered from the primary literature (sources listed in Appendix 3). Following Han et al. (2015), boosted regression trees (BRT) (Friedman, 2001) were used to fit a logistic-like predictive model relating the status of all possible virus-vector pairs (0: not associated, 1: associated) to a predictor matrix comprising the traits of the mosquito and virus traits in each pair. Boosted regression trees circumvent many issues associated with traditional regression analysis (Elith et al., 2008), allowing for complex variable interactions, collinearity, non-linear relationships between covariates and response variables, and missing data. Additionally, this technique performs well in comparison with other logistic regression approaches (Friedman, 2001). Trained boosted regression tree models are dependent on the split between training and testing data, such that each model might predict slightly different propensity values. To address this, we trained an ensemble of 25 internally cross-validated BRT models on independent partitions of training and testing data. The resulting model demonstrated low variance in relative variable importance and overall model accuracy, suggesting models all converged to a similar result. Prior to the analysis of each model, we randomly split the data into training (70%) and test (30%) sets while preserving the proportion of positive labels (known associations) in each of the training and test sets. Models were trained using the gbm package in R (Ridgeway, 2015), with the maximum number of trees set to 25,000, a learning rate of 0.001, and an interaction depth of 5. To correct for optimistic bias (Smith et al., 2014), we performed 10-fold cross validation and chose a bag fraction of 50% of the training data for each iteration of the model. We estimated the performance of each individual model with three metrics: Area Under the Receiver Operator Curve, specificity, and sensitivity. For specificity and sensitivity, which require a preset threshold, we thresholded predictions on the testing data based on the value which maximized the sum of the sensitivity and specificity, a threshold robust to the ratio of presence to background points in presence-only datasets (Liu et al., 2016). Variable importance was quantified by permutation (Breiman, 2001) to assess the relative contribution of virus and vector traits to the propensity for a virus and vector to form a pair. Because we transformed many categorical variables into binary variables (e.g., continental range as binary presence or absence by continent), the sum of the relative importance for each binary feature was summed to obtain a single value for the entire variable. Each of our twenty-five trained models was then used to predict novel mosquito vectors of Zika by applying the trained model to a data set consisting of the virus traits of Zika paired with the traits of all mosquitoes for which flaviviruses have been isolated from wild caught individuals, and, depending on the species, may or may not have been tested in full transmission cycle experiments (a total of 180 mosquito species). This expanded dataset allowed us to predict over a large number of mosquito species, while reasonably limiting our dataset to those species suspected of transmitting flaviviruses. The output of this model was a propensity score ranging from 0 to 1. In our case, the final propensity score for each vector was the mean propensity score assigned by the twenty-five models. To label unobserved edges, we thresholded propensity scores at the value of lowest ranked known vector (Liu et al., 2013). In addition to conventional performance metrics, we conducted additional analyses to further validate both this method of prediction, and our model specifically. To account for uncertainty in the vector-virus links in our initial matrix, we repeated our analysis for a vector-virus matrix with a less conservative definition of a positive link (field isolation and above), referred to as our supplementary model. Vector competence is a dynamic trait, and there exists significant intraspecific variation in the ability of a vector to transmit a virus for certain species of mosquitoes (Diallo et al., 2005; Gubler et al., 1979). Our supplementary model is based on a less conservative definition of vector competence and includes species implicated as vectors, but not yet verified through laboratory competence studies, and therefore accounts for additional uncertainty such as intraspecific variation. While this approach is well-tested in epidemiological applications (Parascandola, 2004), it has only recently been applied to predict ecological associations, and, as such, has limitations unique to this application. To further evaluate this prediction method, we performed a modified ‘leave-one-out’ analysis, whereby we trained a model to a dataset from which a well-studied virus had been omitted, and then predicted vectors for this virus and compared them against a list of known vectors. We repeated this analysis for West Nile, dengue, and yellow fever viruses, following the same method of training as for our original model. While this analysis differs from our original method, it provides a more stringent evaluation of this method of prediction because the model is trained on an incomplete dataset and predicts on unfamiliar data, a more difficult task than that posed to our original model. The primary model is trained on vector-virus pairs for which the full transmission cycle has been observed. However, many sources, such as the Global Infectious Diseases and Epidemiology Network database (GIDEON), interpret isolation of a virus in wild-caught mosquitoes as evidence of a mosquito’s role as a vector. In order to investigate the robustness of our findings, we conducted a supplementary analysis in which any evidence for association, including isolation of the virus, is used as the basis for a link in the vector-virus network. As in the primary model, the mosquito-virus pair matrix was constructed based on the Global Infectious Diseases and Epidemiology Network database (GIDEON, 2016), the International Catalog of Arboviruses Including Certain Other Viruses of Vertebrates (ArboCat) (Karabatsos, 1985), The Encyclopedia of Medical and Veterinary Entomology (Russell et al., 2013) and (Mackenzie et al., 2012). This resulted in a dataset containing 180 mosquito species and 37 viruses, for a total of 334 vector-virus pairs. The vector and virus trait datasets were identical to those used in the primary model (see Appendix 2 for lists of traits). We used boosted regression trees (Friedman, 2001) to fit a logistic-like predictive model relating the status of all possible virus-vector pairs (0: not associated, 1:associated) to a predictor matrix comprising the traits of the mosquito and virus traits in each pair. We fit a total of 25 models, applying different training and testing datasets to each, to reduce the dependence dependent on the split between training and testing data. Prior to the analysis of each model, we randomly split the data into training (70%) and test (30%) sets while preserving the proportion of positive labels in each of the training and test sets. Models were trained using the gbm package in R (Ridgeway, 2015), with the maximum number of trees set to 25,000 and a learning rate of 0.001. To correct for optimistic bias (Smith et al., 2014), we performed 10-fold cross validation and bagged 50% of the training data for each iteration of the model. These methods are identical to those used to train the primary model. We quantified variable importance by permutation (Breiman, 2001) to assess the relative contribution of virus and vector traits to the propensity for a virus and vector to form a pair.Each of our twenty-five trained models was then used to predict novel mosquito vectors of Zika over the whole virus-vector pair dataset, resulting in twenty-five propensity values assigned to each mosquito species, of which we took the mean. Our prediction dataset, therefore, consisted of the common virus traits of Zika paired with the common traits of all mosquitoes in our flavivirus dataset, for a total of 180 species. The output of this model was a propensity score ranging from 0 to 1. In our case, the final propensity score for each vector was the mean propensity score assigned by the twenty-five models. To label unobserved edges, we thresholded propensity at the value of lowest ranked known vector (Liu et al., 2013). Boosted regression models trained on the weakest evidence of association accurately predicted mosquito vector-virus associations in the test dataset (AUC= 0.84 ±0.02). When thresholded at the value of the lowest ranked known vector, the model predicted 66 potential vectors of ZIKV, including 42 unknown vectors LABEL:table:predictions. The majority of predicted vectors were Aedes species (39 species), with Culex as the second most predicted genus (15 species). It included all but three of the vectors predicted by the main model (Ae. occidentalis, Ru. frontosa, Cx. rubinotus). Our supplementary and primary models, trained on virus isolation and above and full transmission cycle, respectively, generally concur. 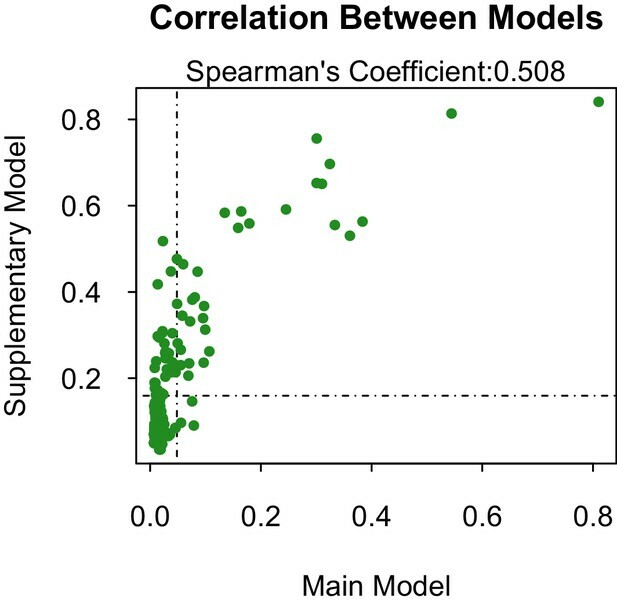 The models are fairly correlated (Spearman’s coefficient, ρ=0.508 when considering the propensities of all 180 species 1. However, when only comparing the correlation of propensities between those vectors above the threshold of lowest ranked known vector, the models become much more correlated (ρ=0.693). This suggests that our model has a higher sensitivity than specificity, and is better able to predict those vectors that are competent for ZIKV than those that are not. The predictive accuracy of our supplementary model was slightly lower than our primary model. However, this may be an indirect effect of a lower positive-negative label ratio in the dataset used in the primary model, which can artificially inflate AUC values (Lobo et al., 2008). The models differ in their ability to differentiate between vectors and non-vectors. The distribution of propensities for our main model is more skewed towards lower propensity values than is the supplementary model 2. This is logical, as the dataset used to train the main model contains a higher proportion of zeros (e.g. vector-virus pairs with no known association) than the supplementary model. The difference in distributions is accounted for by a similar discrepancy in threshold propensity values based on the lowest ranked known vector. The main model, which has a higher frequency of near-zero propensities, uses a lower threshold value than the supplementary model, however both thresholds qualitatively lie above the majority of the distributions. In summary, our supplementary model predicts which mosquito species may test positive for ZIKV through isolation in wild-caught individuals. As isolation can be understood as evidence of a vector’s role in transmission of a disease, our supplementary model may also be interpreted as a ranking of potential vectors of ZIKV, similar to our main model. In fact, both models are well correlated in their ranking of species, although the main model, which trains on fewer vector-virus links, predicts fewer vectors than the supplementary model. Those species predicted by both models, such as Cx. quinquefasciatus and Ae. vexans, should be prioritized for further research on their competency to transmit ZIKV. Furthermore, as suggested by the main model, the current geographic range at risk for ZIKV transmission in the United States should be expanded to include the range of these species ranked highly by both our main and supplementary models. Vector predictions by the supplementary model. Propensity values of the main and supplementary models. Dashed lines represent corresponding threshold values for each model based on lowest ranked known vector propensities. Distribution of propensity values for the main and supplementary models. Table of mosquito traits used in model. Table of virus traits used in model. Primary sources for mosquito traits. Primary sources for virus traits. The American Journal of Tropical Medicine and Hygiene 8:41–45. Journal of the Egyptian Society of Parasitology 41:615–634. Journal of Medical Entomology 47:22–27. Journal of Medical Entomology 42:981–985. Journal of Medical Entomology 45:873–876. Journal of Medical Entomology 42:278–284. Journal of the National Science Council of Sri Lanka 22:279–290. Journal of the Egyptian Society of Parasitology 42:191–202. Journal of Medical Entomology 44:1102–1108. Vector-Borne and Zoonotic Diseases 4:360–378. Journal of Medical Entomology 39:777–785. Contributions of the American Entomological Institute 10:1–176. Meditsinskaia Parazitologiia I Parazitarnye Bolezni 3:39–40. Journal of Vector Ecology 34:276–293. 341–345, The incrimination of arthropods as vectors of disease, Proceedings of the 11th International Congress of Entomolgoy, 1962. Zeitschrift Fuer Angewandte Zoologie 70:73–90. Bangladesh Journal of Zoology 14:41–48. Journal of the Entomological Society of British Columbia, 75. The American Journal of Tropical Medicine and Hygiene 67:85–92. PLOS Neglected Tropical Diseases 9:e0004250. Second Edition: Bacterial, Rickettsial, Chlamydial, and Mycotic Zoonoses, Handbook of Zoonoses, CRC Press. The Journal of Communicable Diseases 26:133–138. US Dept of the Navy, Bureau of Medicine and Surgery. Transactions of the Royal Society of Tropical Medicine and Hygiene 50:238–242. Bulletin of Entomological Research 52:709–725. Bulletin of Entomological Research 65:69. Journal of Vector Ecology : Journal of the Society for Vector Ecology 26:103–109. Bulletin De La Société De Pathologie Exotique 106:113–125. Journal of the American Mosquito Control Association 15:128–132. The Arboviruses: Epidemiology and Ecology 3:62–92. Tuscaloosa: University of Alabama Press. American Journal of Tropical Medicine and Hygiene 82:1172–1184. Journal of the American Mosquito Control Association 3:176–180. Annals of the Entomological Society of America 108:449–458. Medical and Veterinary Entomology 7:141–146. Medical and Veterinary Entomology 6:143–148. Medical and Veterinary Entomology 3:231–237. Transactions of the Royal Society of Tropical Medicine and Hygiene 69:415–425. Annals of the Entomological Society of America 53:706–708. Medical and Veterinary Entomology 13:423–430. Medical and Veterinary Entomology 18:247–255. PLOS Neglected Tropical Diseases 10:e0004543. American Journal of Public Health and the Nations Health 34:75–76. Journal of the American Mosquito Control Association 22:213–221. East African Medical Journal 39:511–514. Journal of Vector Ecology 21:1–5. Journal of Vector Ecology 21:6–13. The American Journal of Tropical Medicine and Hygiene 68:495–500. Bulletin of Entomological Research 65:81–96. Bulletin of Entomological Research 68:707–719. American Journal of Epidemiology 14:130–141. Annual Review of Entomology 46:111–138. Garcia De Orta. Série De Zoologia 17:31–35. II. Frequencia Mensal E No Ciclo Lunar. Memoirs Instituto Oswaldo Cruz-Fiocruz 80:123–133. Cahiers O.R.S.T.O.M. (Office De La Recherche Scientifique Et Technique Outre-Mer) Serie Entomologie Medicale Et Parasitologie 16:73–84. Vector-Borne and Zoonotic Diseases 12:657–665. The New Zealand Medical Journal 120:U2830. Bulletin De La Société De Pathologie Exotique 87:267–277. PLoS Neglected Tropical Diseases 6:e1649. The American Journal of Tropical Medicine and Hygiene 73:445–449. Bulletin De La Société De Pathologie Exotique 92:343–348. Australian Journal of Experimental Biology and Medical Science 42:149–164. Journal of Vector Ecology 37:342–350. Bulletin De La Société De Pathologie Exotique 54:1253–1265. Journal of Medical Entomology 42:838–843. Journal of Animal Ecology 77:802–813. Vector-Borne and Zoonotic Diseases 7:129–142. Annals of Tropical Medicine & Parasitology 20:97–108. Journal of the Entomological Research Society 10:1–9. International Journal of Environmental Research and Public Health 10:4718–4727. Infection, Genetics and Evolution 11:1577–1585. PLOS Neglected Tropical Diseases 10:e0004993. Journal of Economic Entomology 52:490–492. Revista De Saúde Pública 22:84–93. Vector-Borne and Zoonotic Diseases 11:1173–1179. Journal of Medical Entomology 39:541–544. The Annals of Statistics 29:1189–1232. 103–118, Natural History of Culiseta Impatiens (Wlk. ), (Diptera, Culicidae), in Alaska. Transactions of American Microscopical Society, 72, 10.2307/3223507. Journal of Medical Entomology 43:552–563. Journal of Medical Entomology 32:573–577. The American Journal of Tropical Medicine and Hygiene 31:98–137. The American Journal of Tropical Medicine and Hygiene 30:533–574. The American Journal of Tropical Medicine and Hygiene 7:429–440. Cahiers O.R.S.T.O.M. (Office De La Recherche Scientifique Et Technique Outre-Mer) Serie Entomologie Medicale Et Parasitologie 14:125–140. Journal of the Acadian Entomological Society 3:7–27. Publications of the South African Institute for Medical Research 54:1–343. Epidemiologia e Serviços de Saúde 19:101–113. Journal of General Virology 91:87–94. The American Journal of Tropical Medicine and Hygiene 7:365–373. Journal of Medical Entomology 43:614–622. The American Journal of Tropical Medicine and Hygiene 28:1045–1052. Memórias Do Instituto Oswaldo Cruz 95:753–760. Emerging Microbes & Infections 5:e102. PLoS Neglected Tropical Diseases 6:e1477. Bulletin of the World Health Organization 31:57–69. Bulletin of Entomological Research 33:91–142. Bulletin of Entomological Research 37:57–82. Bulletin of Entomological Research 37:57. Bulletin of Entomological Research 52:317–351. Bulletin of Entomological Research 55:589–608. Journal of Medical Entomology 49:371–377. Annual Review of Entomology 53:273–291. PLOS Neglected Tropical Diseases 10:e0004815. Journal of the American Mosquito Control Association 11:375–376. Journal of the American Mosquito Control Association 23:224–225. Annual Review of Entomology 28:229–262. Journal of the American Mosquito Control Association 11:211–224. Collection records of the project "Mosquitoes of Middle America"
Cah ORSTOM Ser Ent Med Et Parasitol 14:235–244. Cah ORSTOM Ser Ent Med Et Parasitol 24:59–65. The American Journal of Tropical Medicine and Hygiene 31:659–664. Adlard & Son, Ltd, British Museum of Natural History. Vector-Borne and Zoonotic Diseases 16:673–676. Australian Journal of Entomology 48:53–59. Journal of Medical Entomology 46:1167–1175. Journal of the Entomological Society of Southern Africa 30:34–39. Journal of the American Mosquito Control Association 14:40–45. Transactions of the Royal Society of Tropical Medicine and Hygiene 96:493–498. Journal of Medical Entomology 12:647–651. Journal of the American Mosquito Control Association 3:131–136. Journal of Entomology of South Africa 30:243–250. Journal of Medical Entomology 41:994–996. Journal of the American Mosquito Control Association 19:151–154. The American Journal of Tropical Medicine and Hygiene 27:372–440. Bulletin De La Société De Pathologie Exotique 86:68–75. Bulletin De La Société De Pathologie Exotique 85:388–389. Annual Review of Entomology 59:31–49. Journal of Medical Entomology 37:846–853. Journal of Medical Entomology 24:35–39. Journal of the Egyptian Society of Parasitology 28:449–459. Ann Trop Med and Parasitol [Liverpool] 26:119–127. Journal of Arthropod-Borne Diseases 8:163–173. Proceedings of the Entomological Society of Washington 48:186–190. Journal of Insect Science 12:6. Journal of Communicable Diseases 20:280–286. The Indian Journal of Medical Research 89:52–55. Revista Brasileira De Entomologia 52:663–668. Bulletin De La Société De Pathologie Exotique 53:1054–1064. PLoS Neglected Tropical Diseases 8:e3188. The Korean Journal of Parasitology 33:19–26. Infection, Genetics and Evolution : Journal of Molecular Epidemiology and Evolutionary Genetics in Infectious Diseases 28:681–690. Bulletin of Entomological Research 75:661. Global Ecology and Biogeography 17:145–151. Journal of the American Mosquito Control Association 7:395–399. Arquivos De Biologia E Tecnologia 39:671–676. VI. Larvae Collections in the Home Surroundings. Revista Brasileira De Zoologia 14:571–578. Bulletin of Entomological Research 70:309–320. Vector Borne and Zoonotic Diseases 14:656–664. Journal of Medical Entomology 1:335–347. Journal of Medical Entomology 47:238–248. Biomedica : Revista Del Instituto Nacional De Salud 33 Suppl 1:185–189. Journal of Medical Entomology 35:1007–1012. Journal of Medical Entomology 10:206–208. Annals of Tropical Medicine & Parasitology 54:300–304. Bulletin of Entomological Research 105:637–663. Journal of Medical Entomology 45:1143–1151. The American Journal of Tropical Medicine and Hygiene 75:1140–1147. Journal of Medical Entomology tjw212. Vector Borne and Zoonotic Diseases 7:279–284. Journal of the American Mosquito Control Association 8:52–57. Journal of the Egyptian Society of Parasitology 20:265–268. Bulletin De La Société De Pathologie Exotique 50:378–381. Journal of Medical Entomology 47:226–229. Vector-Borne and Zoonotic Diseases 11:1157–1163. Medical Entomology and Zoology 50:267–273. Journal of Vector Borne Diseases 44:44–51. Journal of Vector Borne Diseases 46:65–71. Revista Brasileira De Entomologia 41:213–216. Journal of Entomology and Zoology Studies 3:169–172. Journal of Medical Entomology 52:375–385. The American Journal of Tropical Medicine and Hygiene 86:993–996. Archiv Fur Die Gesamte Virusforschung 36:105–114. The Journal of General Virology 86:121–124. Bulletin of Entomological Research 60:473. Nigerian Journal of Entomology 3:81–92. International Journal of Mosquito Research 2:106–113. Perspectives in Biology and Medicine 47:244–261. Transactions of the Royal Society of Tropical Medicine and Hygiene 86:307–313. The Journal of Parasitology 33:43–50. International Journal of Infectious Diseases 44:11–15. Memórias do Instituto Oswaldo Cruz 104:592–598. Memórias Do Instituto Oswaldo Cruz 108 Suppl 1:11–17. Journal of Insect Science 12:1–8. Journal of the American Mosquito Control Association 28:219–224. Journal of Medical Entomology 50:1097–1104. PLoS Neglected Tropical Diseases 5:e1369. Zoological Journal of the Linnean Society 153:29–114. Contributions of the American Entomological Institute 5:1–44. Medical and Veterinary Entomology 8:187–193. Bulletin of Entomological Research 85:125–133. The American Journal of Tropical Medicine and Hygiene 46:654–663. Journal of Medical Entomology 8:363–366. Journal of Medical Entomology 43:1134–1141. Gbm: generalized boosted regression models, R package version 2.1.1. Journal of Medical Entomology 35:948–955. Journal of the American Mosquito Control Association 24:359–367. Journal of the American Mosquito Control Association 21:458–463. Journal of Vector Ecology 31:198–205. Australian Journal of Entomology 25:235–240. Journal of the American Mosquito Control Association 28:24–27. Australian Journal of Entomology 39:212–218. The Indian Journal of Medical Research 93:253–258. Journal of the American Mosquito Control Association 12:517–600. MMWR. Morbidity and Mortality Weekly Report 65:59–62. Revue De Zoologie Et De Botanique Africaines 4:311–330. Journal of Vector Ecology 35:156–162. Entomologia Experimentalis Et Applicata 120:195–200. The Journal of Applied Ecology 2:1–16. Bulletin of Entomological Research 55:637–643. Springer Science & Business Media, 10.1007/978-94-015-8113-4. Journal of Medical Entomology 40:921–929. Turkish Journal of Zoology 28:337–344. American Journal of Epidemiology 180:318–324. Bulletin of Entomological Research 62:517–526. Bulletin of Entomological Research 68:695–706. Proceedings of the Royal Entomological Society of London. Series B, Taxonomy 36:11–16. Memórias Do Instituto Oswaldo Cruz 108:563–571. South African Medical Journal = Suid-Afrikaanse Tydskrif Vir Geneeskunde 29:1114–1120. Memórias Do Instituto Oswaldo Cruz 104:11–17. Journal of Vector Borne Diseases 51:251–258. Journal of Vector Ecology 38:237–244. Journal of Medical Entomology 5:329–331. Transboundary and Emerging Diseases 62:209–216. The Southeast Asian Journal of Tropical Medicine and Public Health 33:532–546. Journal of Medical Entomology 38:480–492. The Southeast Asian Journal of Tropical Medicine and Public Health 43:1375–1379. Journal of Medical Entomology 42:57–62. Journal of Medical Entomology 38:130–134. Documenta Neerlandica Et Indonesica De Morbis Tropicis; Quarterly Journal of Tropical Medicine and Hygiene 1:142–144. Journal of Vector Ecology 37:49–61. Bulletin of Entomological Research 103:193–203. Journal of Medical Entomology 47:670–676. American Journal of Tropical Medicine 25:225–230. Zhonghua Minguo Wei Sheng Wu Xue Za Zhi = Chinese Journal of Microbiology 8:274–279. Journal of Medical Entomology 49:1283–1288. Archives De l’Institute Pasteur d’Algerie 24:153–156. In: CJ Peters, CH Calisher, editors. Infectious Diseases From Nature: Mechanisms of Viral Emergence and Persistence. Springer-Verlag/Wien: Springer Vienna. pp. 33–44. Bulletin - Institute for Medical Research, Kuala Lumpur 11:1–114. Australian Journal of Entomology 44:110–112. Australian Journal of Experimental Biology and Medical Science 59:357–367. Journal of Medical Entomology 42:739–750. Journal of Medical Entomology 51:89–96. New Zealand Journal of Zoology 34:57–61. Thank you for submitting your article "Data-driven identification of potential Zika virus vectors" for consideration by eLife. Your article has been reviewed by three peer reviewers and the evaluation has been overseen by a Reviewing Editor and Prabhat Jha as the Senior Editor. The following individual involved in review of your submission has agreed to reveal his identity: Anthony Wilson (Reviewer #3). 1) More rigorous model evaluation- from a statistical point of view, yes the model AUCs seem reasonable, but we all felt that this alone, was not enough to judge how effective these predictions were. A key assumption of the approach is that vector competence is associated with the kinds of traits that are readily observable and comparable. In addition to this, many key indicators that might be important for this are not included/considered, e.g. sub-species of vectors, evolutionary changes in vector competence. Judging by the top model predictors, it seems that there are very few traits that offer much explanatory power in this respect and perhaps a more nuanced explanation of why the model predict each of these new Zika vector species is required. Additionally we would like to see validation against a known outcome, e.g. if the vector-virus pairs of dengue, yellow fever or West Nile were left out of the fitting set what vector species would be predicted for each of these? 2) The caveats of this particular study need to be more appropriately articulated. The main output of this model is a list of candidate vector species to be tested experimentally for Zika virus competence (and ideally prioritised by likelihood of competence as predicted by the model and public health importance- i.e. additional population at risk, none of which is currently done in the paper). As it has been demonstrated many times that vector competence does not equate to sufficient vectorial capacity to cause outbreaks, let alone sustain transmission, it is perhaps premature to suggest that new risk assessments need to include other vector species at this stage. Please revise this and consider refocusing on providing useful recommendations for follow up studies. Evans and colleagues have submitted a manuscript detailing a novel and well conducted analysis that addresses a timely question of international public health importance. While, at times, the manuscript does overstate the significance of the findings and omits some important limitations, it is fundamentally an exciting study that could be of interest to a broad range of readers. I am struggling to reconcile the parallel findings of high model performance (as demonstrated by AUC) and the finding that subgenus and continental range (two variables with extremely limited degrees of freedom, especially where Zika is concerned) contribute a high amount of the models' power. It seems that these very general and non-specific covariates would naturally lead to low specificity- how does the model AUC vary when predicting vector virus pairs for viruses with different characteristics – are very limited geographic scope viruses much easier to predict? If so, is there a more appropriate model evaluation measure for a broadly distributed disease such as Zika (and thus differing thresholds)? It would at least be useful to explain what features of Zika lend it to such a high number of predicted vectors relative to, say dengue. This analysis quite rightly restricts its predictions to binary endpoint of vector competence. There is, however, a big difference between a competent vector and a vector that presents a true epidemiological risk. This is exemplified by Ae. aegypti vs Ae. albopictus in dengue with the former being responsible for the vast majority of transmission (see Lambrechts et al. 2010 PLoS NTDs). While I agree with the authors that these findings warrant further investigation of the competence of these species, to suggest that they need to be included in Zika risk maps makes too many assumptions (e.g. epidemiological significance, that other species will not outcompete their role as a vector, etc.) that are not supported by analysis in this manuscript. I would suggest re-wording to reduce the emphasis on this suggestion and including more limitations on why these vector species may not ultimately be epidemiologically significant. This study used data-driven, machine-learning algorithms to identify potential vectors of Zika virus. Although the premise of the study is good, several shortcomings of the approach make it difficult to ascertain the relevance of the results, which could be largely misleading. Some of the most important shortcomings are listed below. The authors set out to "address the problem of identifying potential vector candidates in a suitable time frame" because "the amount of time required for analyses can delay decision making". However, identifying candidate Zika virus vectors would not preclude their subsequent empirical validation. So it is unclear what is the applied value of this modeling exercise. A strong, unjustified assumption underlying the approach is that "the propensity of mosquito species to associate with Zika virus is statistically associated with common mosquito traits". Documented implication of a given mosquito species in the transmission cycle of an arbovirus does not necessarily imply the universal importance of a vector species in the transmission cycle of this arbovirus. Vectorial capacity results from the combination of several factors, so that in certain local conditions (e.g., high mosquito population density, high temperature) even a poorly competent vector could play a significant role in transmission. Vector status of a mosquito species for a given arbovirus cannot be permanently defined. Vector status is a dynamic process that can rapidly evolve (e.g., recent adaptation of chikungunya virus to Aedes albopictus). Intra-species variation, which can be substantial for several mosquito traits, was ignored. There was no empirical validation of the modeling approach. Vector-borne pathogens are emerging with increased frequency. This manuscript presents an interesting and potentially useful approach to the incrimination of vectors of novel emerging pathogens and I believe it to be worthy of publication. I have a couple of queries and suggestions, detailed below. Results section, third paragraph: I suspect one criticism of this approach will be that it results in overly broad predictions (although even if true that would not mean it will not be useful in suggesting targets for epidemiological study). I would like the authors to add the result of applying the same method to 'predict' the vectors of dengue virus, yellow fever and West Nile virus when information on the respective viruses is removed from the training data. Discussion section, first paragraph: could the authors elaborate on the additional regions or populations at risk from transmission based on their expanded 'worst case' vector list – or, even better, which newly-incriminated vectors make most difference to this? This should be possible using the dataset they have already collected (with the caveat that this is a worst-case scenario, and vector density and local environmental conditions also affect the potential for transmission). Thank you for this comment. To clarify, the association of traits with competence is not an “assumption” of the approach, but rather a conjecture in the form of a “working hypothesis” that is supported or not by the analysis. (Our original language was imprecise in this respect, and we have corrected it.) While we agree that sub-species identity or evolutionary change could be important, they are not features that are consistently available across this set of mosquitoes and cannot be readily mapped even for those species for which they are known. Thus, although they might be scientifically important for further research, they are not practically useful for our purposes. The limitation that this creates is that our model may not be as predictive as it could be with other information sources. Since new information would not erode the predictive performance of our model, we believe that the model is “at least as good” as measured, although possibly it can be improved in the future. Nonetheless, we agree that “more rigorous model evaluation” is warranted and thank the reviewers for their suggestions in this respect. The new analyses we performed in response to reviewer comments, as described below, have now further validated our technique and increased our confidence in the models’ predictions. Particularly, we followed the suggestion of reviewers to validate our method by predicting the vectors of several of the “better-studied” viruses. Thus, we fit models to datasets iteratively omitting West Nile virus, yellow fever virus, and dengue virus to compare the models’ predictions against the “known outcome” of vectors of these viruses (subsections “Model Validation”). We note that this is not a perfect validation. First, there may yet be unidentified vectors of, say, West Nile virus, that if predicted by our model would score as “false positive” when in fact correct. Further, omitting data in model training and subsequently predicting onto the omitted data is a more difficult task than that asked of our original model (in which it at least had access to a portion of Zika virus links, i.e., the known ones). Nonetheless, these models were able to predict vectors of these viruses remarkably well for West Nile virus and dengue virus, although not for yellow fever virus (which we think informative). Specifically, yellow fever virus was special among the “better- studied” viruses in that the majority of its vectors were linked only with yellow fever virus. Thus, it would not be expected that other virus-mosquito pairs would be very informative. Omitting these links from the training dataset, therefore, resulted in incorrect predictions of these links (AUC = 0.47). This was especially true for species of the Haemogogus genus, which was completely omitted from the training dataset. In contrast, the vectors of West Nile virus and Dengue virus were highly predictable with models fit to the partial data (with AUC of 0.693 and 0.918, respectively). Since this was the performance on a more difficult task than our original model (i.e., no data from the target viral species rather than partial data from the target species), we think these quantities give roughly a lower bound – what we might call a worst case scenario – since it is a lower bound in the sense that the test data cannot be verified to be complete and since the task is harder than the one we attempt for Zika. (Of course, we advise against over-interpretation here – we have only two species which have highly divergent AUC scores, although both are significantly greater than random guessing. In further response to the point about covariates, we note that data-driven modeling differs from traditional statistical modeling in that the relationship between predictor and response variables is not predetermined or explicitly stated (Breiman 2001, for instance, discusses this issue at length). Inferring causal relationships between predictor and response variables, therefore, is not advised. While we can describe trends within our dataset from our analysis, concluding the mechanism responsible for predicting a positive link, and attempting to generalize from this, would be conjecture. For this reason, we do not go into detail on why these vectors were ranked highly by the model. improve our assessment of transmission risk, but a first step towards this ultimate goal is to assess whether particular species are competent, so that they may be prioritized for the experimental testing required to confirm vectorial capacity (and to quantify transmission risk). We clarify these caveats (i.e., competence does not equal vectorial capacity or transmission risk) in the Discussion section. We are not sure what the Reviewer #1 means by “degrees of freedom” in this context – possibly the amount of variation in the input variable, which is how we have interpreted it in our response. In this case, we note that there is an important distinction between our reported performance (AUC, which represents classification accuracy of our model and may be calculated virus by virus) versus variable importance, which represents how important a particular variable is for classification accuracy, and is based on the sensitivity of an AUC calculated for all vector-virus links in the testing dataset, not only those of Zika. For the former, the results of the added”leave-one out” analysis offers some insight into how each vector-virus link impacts model performance (reported above). In that case, we did test model performance against a known outcome, and found similarly high model performance. (subsections “Model Validation”). We hesitate to consider “limited geographic scope viruses” vs. other viruses. For many decades, Zika and West Nile virus would both have been considered to have limited geographic scope, though now are among the most widespread flaviviruses. This suggests that geographic range may not be as static a trait of viruses, particularly those that are emerging. In contrast,”subgenus” is assigned on the basis of phylogeny and therefore more intrinsic and less sensitive to temporal expansion. We strongly agree that empirical validation of these vectors is necessary to better predict risk of Zika transmission, and believe the value of our exercise is that it provides a list of candidate vectors that should be prioritized by those validating vector competence. We have edited our manuscript to clarify that our results are not meant to replace empirical validation of vectors, but to guide empirical work and focus initial vector competence studies on these candidate species when the results are time-sensitive. Our initial phrasing of this assertion was misleading. Our study is not predicated on the assumption of this relationship, but, rather provides a test of this conjecture. Our model’s ability to draw on vector and virus traits associated with positive links, and use this information to accurately predict vectors of flaviviruses (as evidenced by its performance on the testing data) supports the theory that a vector’s propensity to associate with a specific flaviviruses is statistically associated with measurable traits. We entirely agree. We make no claims of “universal importance”. Indeed, we have endeavored throughout not to overstate the implications of our study. While our model can predict probable competency, it does not speak to the relative vectorial capacity of predicted species. We have attempted to be precise throughout, specifically in Discussion paragraph four, and would welcome the reviewer to identify any further instances where we overstep. Of course, we agree. The fact of biological evolution means all biological associations are necessarily malleable. What we think is interesting and important is that species-level associations are stable enough to enable predictions to be made – as documented here. Nonetheless, we appreciate the reviewer’s counter-example. To incorporate vector status uncertainty in our model, we created a supplementary model trained on a dataset whose definition of a vector is less conservative, thereby including those species whose vector status is more uncertain. Predictions of vectors between the two models were correlated, although the model’s performance was lower, illustrating that additional uncertainty does lower model performance, but without significantly altering qualitative results of the model. We added additional discussion about this uncertainty and how we incorporated this into the analysis. competence. A list of these likely vectors provides a starting point for empirical studies to support more efficient use of limited time and resources. We underscore the utility of our results for prioritizing necessary empirical validation in the lab and the field. Following this suggestion and others, we conducted additional analyses to validate this method of prediction. We fit models to datasets omitting West Nile virus, yellow fever virus, and dengue virus individually to compare the models’ predictions against the “known outcome” of vectors of these viruses, as detailed above (subsections “Model Validation”). We agree that prioritizing geographic regions or populations would be a helpful exercise for public health institutions, but we believe these conclusions are best made by public health experts who are able to incorporate vector biology, local climatic conditions, human exposure patterns, demographic variables, etc. We provide maps of species’ ranges and describe the additional geographic regions which may be at risk, should these candidate species be confirmed as vectors and supply sufficient vectorial capacity. By overlaying species ranges, we hope to demonstrate where transmission may be possible because of the presence of a competent vector, but not presently identified “high risk” areas. As you mention, there are many biotic, environmental and socio-economic local contexts that inform transmission dynamics, and we do not believe this to be a conclusion we can draw from our results. See Discussion paragraph four for further discussion of the limitations of our results.